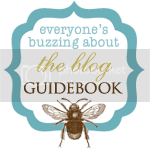 Welcome to the first This & That Creative Party Planning Post! I wanted to start out with something...Bond...James Bond (insert James Bond Theme music). I am a HUGE fan of James Bond. I have always dreamt that in another life, I am a secret agent saving the world one day at a time with my cunning secret agent skills and awesome high-tech gadgets. Since I am not a secret agent (but I wouldn't tell you if I was, now would I? 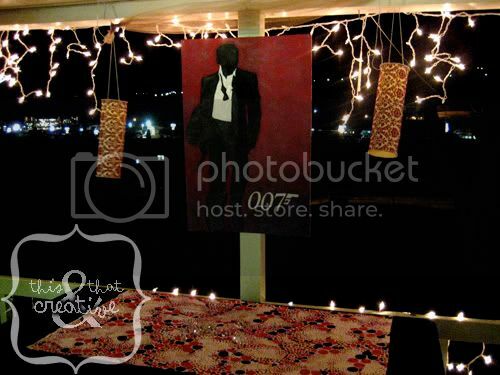 ), I decided to get as close to the action as possible, hence my invention of this 007 party. I just have to tell you that this party was just as fun to invent and plan as it was to be there. I felt like I really was a secret agent on a mission of my own trying to keep the party details a secret from my hubby and friends! We went with red, white, and black as the main colors. I guess I was imagining the classic opening scene of the James Bond movies with James Bond in view of the gun barrel. We used black table cloths, and I also used some red, white, and black dotted fabric that I already had that I thought fit the theme quite well that. We also decided to have metallic colors too, gold and silver. Think classy colors. James Bond definitely has class. I wanted a cool picture of a silhouette of James Bond to put up. I ended up just painting one. If you feel artistically stumped here, you could get a James Bond Poster (click HERE for some) or two to put up. Diamonds, lights, etc. can all set the mood too! Here is the set up we did out on our deck. I just wish it was a little warmer outside that night! I actually made the cylinder lamps pictured above that we had out on the deck. It was easy! I just rolled up some thicker scrapbook paper, glued the ends together, finished it off with ribbon, and used a candle light with a battery as the light. 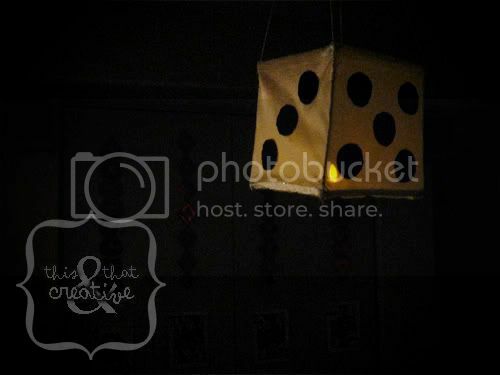 A friend and I also made this dice lamp to hang too. We made it out of wire hangers that we bent to fit the shape. We wrapped the outer edges with a sheer fabric that we hot glued on and then cut small circles out of black material for the dots. Then we used a more bendable wire, wrapped it around the candle light, and hung the candle inside with the wire. Then we attached some ribbon to the top to hang the light. 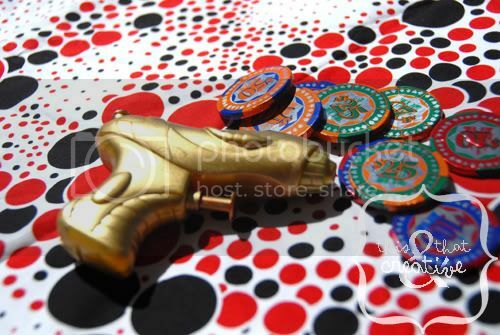 We went for the James Bond Casino Royale theme, so we ended up using cards and casino chips as decorations too. I also got some little cheap squirt guns and spray painted them gold. We added some palm trees to the walls inside the game room to give it a more tropical casino look. 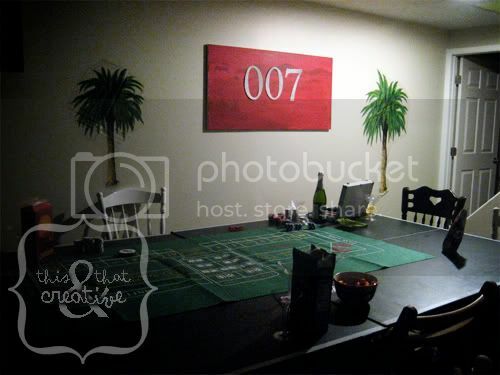 I also got some silver glittery paper and cut out a "007" on my cricut to hang on a canvas that I painted red to make things look a little more Bond. Another idea is to have an "animated poster". You can have the root menu of a James Bond DVD playing on your TV in the background on mute if you have other music on. Let your cups be part of the decorations. You can get those plastic martini glasses to put all the guests drinks in, even if they are not real martinis. We all know James Bond likes his shaken...not stirred. Here's the rest of the money, complete with birthday guest's faces. I also need to add that we did the party at our house, so I had to keep the decorations hidden, and I had to get my husband out of the house so I could decorate. I had one of our friends ask him to go golfing so I could manage to get everything ready without my husband knowing. Honestly, it was kind of hard to work around his schedule, so if you can, it might be best to throw the party at the house of someone who you are not surprising so you have adequate time to decorate. But it did make me feel like my "Secret Mission" was a little more dangerous. My cover could have been blown in an instant! Obviously you will want the classic "James Bond Theme Song". Others can be "Live and Let Die" by Paul McCartney, or "You Only Live Twice" by Nancy Sinatra. Even anything that has to do with secret missions will work. I snuck in some "Secret Agent Man" by Johnny Rivers and some others that I thought would go okay with the theme. We ordered Texas Roadhouse to go because my husband had been wanting to go there again for forever, so I thought it would be nice for his birthday. We asked each couple to bring a little cash (not our fancy customized cash) for the food, since it was going to be a real meal instead of just finger food, and we gave them the choice of ribs or shrimp. Texas Roadhouse doesn't really even fit the theme, but if you do want to go with the theme a little more you can have elegant finger foods, such as shrimp, crackers and cheese, fruit and fruit dips, toasted bruschetta, etc. You can also choose food to fit the main location of one of the Bond movies. He goes all over the world (except for maybe Texas...), so there are lots of options! For drinks, we served Martinelli's Sparkling Cider in different flavors because we don't drink alcohol and we had a few pregnant guests. We served the drinks in plastic Martini glasses for added Bondness. Yes, I do think I just made up the word Bondness. For after dinner while we played games, we had some snacks ready, which included some chocolate casino chips to fit our theme. I also made a dice shaped birthday cake since cake is a must for any birthday party! 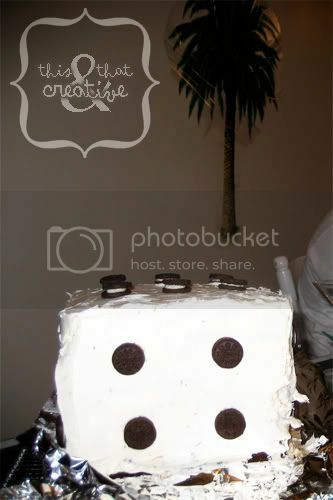 I used little mini Oreos to be the dots on the dice after I frosted the cake all white. If you want a more relaxed party, you can always snuggle up with your significant other and have everyone watch James Bond movies. There are so many to choose from; you can definitely get a variety of both old and new James Bonds. 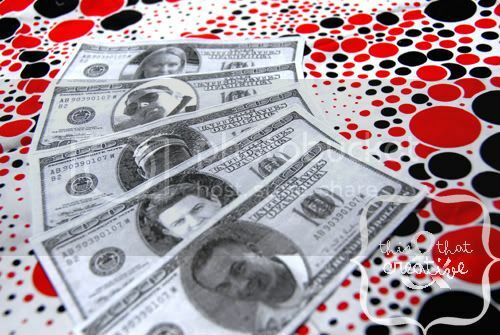 Each guest was given a certain amount of the customized cash (you can add in other fake bills of different amounts to make things a little easier if you are going casino games style). The birthday guests had a little extra from their package (we'll get to the package later in the "Secret Mission"). We played a game of Craps with our fake money and chips, and set a time limit. Honestly, we had to reset the ending time more than once because we were just having too much fun! When our time was up, whoever had the most money won the prize! 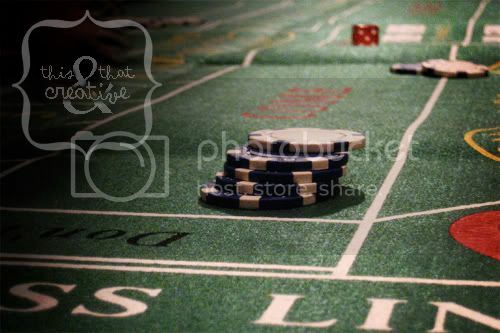 You don't have to stick to Craps, you can play Roulette or Poker or any casino game for that matter. Although, if you have a dealer, it makes it hard to let everyone have a chance to win, unless you give the dealer some type of compensation for not being able to play. You can rotate dealers too. You don't have to play casino games either. You can also just pick out a regular favorite game and have the prize ready for the winner. For some fun James Bond Trivia Games, click HERE or HERE. There is always the James Bond version of Scene It you can play too. But if some of your guests are not as Bond savvy, you may want to shy away from anything that may require too much Bond knowledge so the game offers everyone a fighting chance. When the games die down, then you can put on some James Bond movies for those who still may want to hang around for a happy ending to a mission accomplished. The letters I downloaded were pdfs, so if you don't have an image layering program like photoshop or something similar, it could be hard to alter these to customize your message. I made one in a word document so you can type in your own message. To download it, click HERE. "Agent 007, check inside your glove box to find instructions for your secret mission. ---M"
You will need to make the first part of the mission easy, so that they don't pass it off as a prank and decide not to do the mission. You could maybe add a little personalized information that helps them realize that this isn't some general mass text. They are usually just curious enough to actually do it if it is something they can do pretty quick like taking a look in the glove box. another letter from "M" instructing him to go to a certain address (a gas station in this case) at a certain time and present his bill to the cashier inside. We had it set up so that when he gave the cashier his money, the cashier then checked the name on the bill and had a secret mission package for him with his name on it. If you don't have the name of the birthday guest on your bill, you can always label the package with the matching bill. I went in to talk to the people that worked at the gas station a few days in advance to see if it would be okay if they were allies in our "Secret Mission". They were just as excited to be a part of it as we were! On the day of the party I dropped off the packages for the birthday guests at the gas station so they would be ready for them when they arrived. You don't have to use a gas station either, you could prepay for the food you will be eating at the party and direct one person there to give their bill to the hostess and then they could bring the food to the party. You can imagine how awkward (but fun and exciting at the same time!) this was for the birthday guests, giving the cashier money with his or her face on it. My friend was actually hiding in the gas station parking lot and laughing to herself while she watched each of the birthday guests, one by one at their own instructed specific time, make their way inside the gas station. We wished that we recorded them, or asked the gas station for surveillance footage of them! Surprises really are too fun! pretend money with birthday guests faces on it to use at the "Casino"
a bow tie or a fancy necklace to wear to the party (the spouse's of the birthday guests can provide this), or if you're feeling really into the James Bond theme, you can go all out and have a tux or fancy dress for them to wear to the party; I am really wishing that we all dressed up for ours! address). You are to show up tonight at (give time---all of the birthday guests should be given the same time to show up so you don't have to go through multiple surprises). You will also find your Walther p99 071500 and requested silencer, in case you find yourself in trouble, which will require explanation if used. 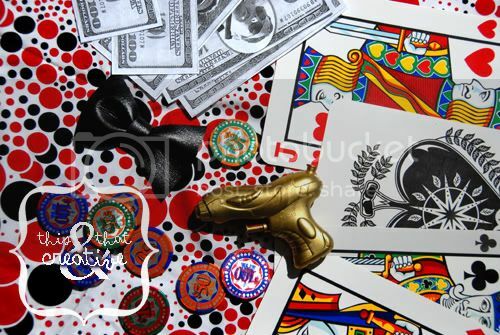 The money included is to be used in your best strategies to leave the Casino Royale with the most money. If you do not leave with the most money, the (name the prize) will go to someone else. We are counting on you to win. You are invited to attend a James Bond Party to celebrate (give reason for party: so and so's birthdy, etc). Show up at Casino Royale, (add info if you want them to show up in formal attire, etc.) located at (give host name and address), on (give date), at (give time). You will receive your casino money from the host upon your arrival. If you do not leave the casino with the most money, the (name the prize) will go to someone else. If you would like to be eligible for (name the prize), we ask you to contribute (give amount) so it can be provided. We are counting on you to win. Part of your mission is to not disclose any of this information to (give list of people that need to be surprised). Please call or text (give number) to let us know if you accept this mission. For the guests who are a spouse of one of the birthday guests, you may have to just call or find another way to invite them so you don't blow your cover! This was such a fun way to invite everyone. When all the guests finally arrived, everyone was talking about the "Secret Mission" the birthday guests had to do to get to the party. And the mission didn't just end there; we were all in it to win it when the fun and games rolled around. 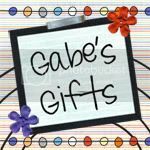 Click on the logo to check it out! Okay, you deserve the wife of the year award. That party sounds like it wold have been so much fun! I absolutely love this. Super creative. I've never seen the movies but am such a fan of surprise parties and road rally type events that this seems like the perfect party! Thank you SO much for the letters, invitations, templates, decoration instructions, text message links, etc! This made throwing my boyfriend's 007 party SO much more exciting and realistic! With a slightly bigger budget, I found a Groupon deal for helicopter flying lessons (which made a great MI6 training exercise), a straight-razor shave at a classy barber shop (Bond has to look his best! 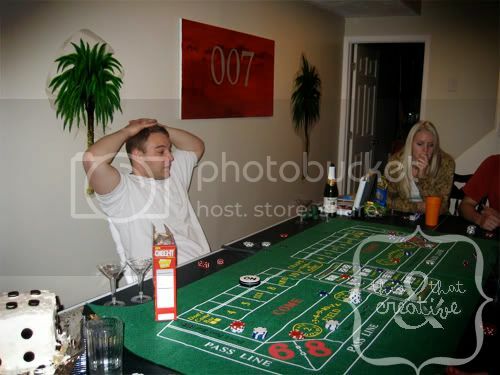 ), a steak dinner with friends (other "agents) and finally, a kidnapping to "Casino Royale" (home, with your decorations) to play poker and complete his mission to win a prize (your mission idea worked great)! The guests LOVED the invitations and party ideas, and were even suggesting sub-missions throughout the party planning process. Everyone had a ton of fun with this and your ideas and templates were really the icing on the cake (the dice cake, like yours)!! Thank you SO SO much! Thank you so much. I have an events business and im organising a 007 party for a client and the birthday person is a female. I found your ideas interesting so thank you for sharing. Good post i have got a great post keep it up.